The Jolly Egg is a uniquely-designed plastic dog toy for all but the smallest dogs. 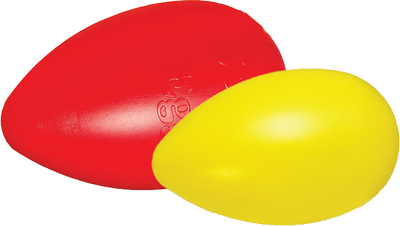 The Jolly Eggs unique shape prevents most dogs from clamping down on the toy, driving even the most sedate dogs to distraction. Jolly Egg is constructed of thick, high-density polyethylene plastic, and can withstand an extraordinary amount of abuse. The Jolly Egg also floats! The ultimate toy for the ball-crazy dog in your life. Available in 2 sizes and 2 colors. 12" Egg has a diameter of 7.5" at it's widest point. 8" Egg has a diameter of 5" at it's widest point.